How can we make a cat toy that is affordable, durable, and engaging? We concluded our Oil Spill Engineering unit last week with a final simulation. Earlier, students worked in groups to experiment with a variety of materials to clean a spill. The task involved creating a plan to efficiently clean a simulated oil spill without exceeding budgetary constraints. Later, students had the opportunity reflect on how they would improve their designs. The first day of the 2018-19 school year was exciting. Our STEAM challenge: Groups of 4 had 16 minutes, 20 spaghetti noodles, and 1 yard of masking tape to build a tower that would support a jumbo marshmallow on the top. 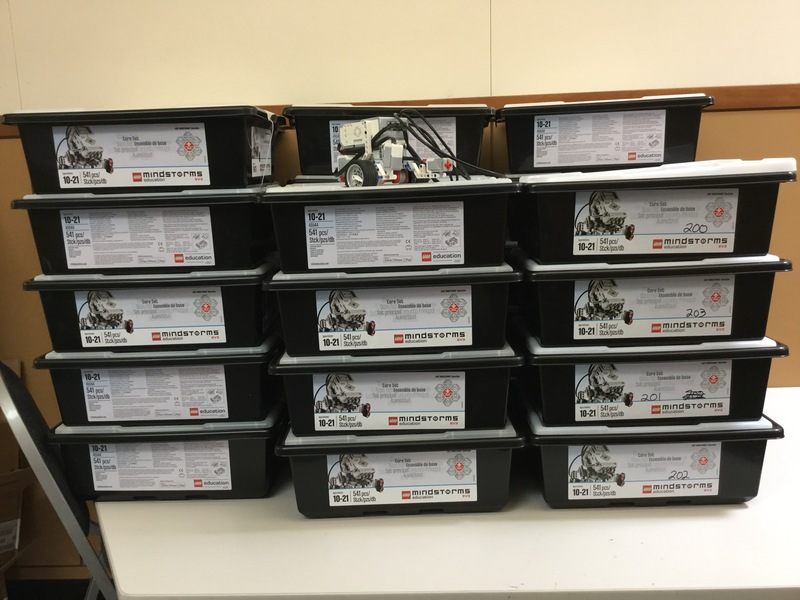 A big THANK YOU goes out to Parent Club (EYST) for fully funding new EV3 robotics kits. We now have the most up-to-date kit versions that will keep our program running for several more years. Today they were unpacked and labeled. Tomorrow they will be in the hands of our students. Thank you to all, too, who donated time, effort, and funding to our Bingo/ Auction NightEarlier this month to make this purchase possible. We are concluding our Oil Spill Engineering and geology unit. After learning about erosion, deposition, and weathering, students explored how an oil spill affects an ecosystem and the tools and methods needed to clean it. Students worked in groups to experiment with a variety of materials to clean a spill. Later they worked with a budget to clean up an oil Spill in a lab setting. Students had the opportunity to improve their designs and reflect on the experience. Our students also were fortunate to enjoy a presentation by PGE environmental specialist, Corey Carlson-Ham. Our students recently collaborated with TRIPAQ manufacturing to design and create containers for plant packages students designed this fall. The cardboard containers arrived this week. Students assembled the boxes to see how well they fit the packages. They also created a short video clip in the SeeSaw app explaining what they did and how well their container fit according to the specifications they sent to TRIPAQ. The videos will be posted on soon on SeeSaw so that students can share with their family members. Lastly, students received the design plans for their box that TRIPAQ designers developed. Students were able to assemble miniature versions of their box to take home. What a great project, and a big thanks to TRIPAQ for making this all possible! Click on the photo below to view many more! Plant Package Engineers in action: Students studied the needs of plants and also the many functions of packages. Their task was to create a package for a live plant out of either a carton or bottle. Plants were placed inside on Friday, and today student groups analyzed and scored their plants’ health and packages according to certain criteria. The next phase is to identify the functions that need improving, and in collaborative groups, improve upon the previous design.